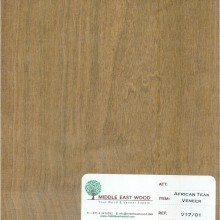 Veneer is genuine wood. It fills your space with the elegance and warmth of natural wooden surfaces while using the least amount of timber. Veneer is relatively cheaper than solid timber, and offers greater stability when used with sheet materials. It is put to most economic use by slicing wooden logs into thin veneer sheets 0.6 mm thick or more. Thanks to various splicing techniques, veneer offers an incredible variety of grain patterns, textures and shapes allowing unlimited architectural and furniture designs. Veneer can be used to make all types of furniture, doors, floors, walls, dashboards, yacht interiors, aircraft interiors, and much more. Middle East Wood offers a stunning variety of natural wood veneers, which add natural glow and beauty to any space or furnishings. We invite you to explore our beautiful collection. A whole log is centered on a lathe and turned against a broad cutting knife set into the log at a slight angle. Rotary cutting or "peeling" of a log produces a continuous sheet of veneer as if the tree was a roll being unrolled. It is the most economical method of cutting; it produces an unpredictable pattern in veneers as it cuts through the successive layers of growth rings. The slicing is made perpendicular to the annual growth rings of the tree. This creates a straight grain appearance. By slicing parallel to the center of the log, a raised "cathedral effect" is formed by the innermost growth rings. This cut of veneer is ideally suited for wall panels, doors and furniture because of the consistency in its grain, and the ability to match sequences of leaves.